When I was last living in the States, the Internet was still fairly young and archaic. We lived on 5 Acres out in the country, so our internet options were very limited. Broadband was just coming into being, but not where we lived. Where we lived, the fastest internet available in 1999 was dial-up, and the speeds maxed out at 28.8 Kbps. We were lucky if we could actually get 14.4 Kbps, though. When we first went to the Philippines to live, the internet was very slow too. About a year after our move, I was able to get “broadband” internet through a satellite dish. I even opened an Internet Cafe with the only broadband speeds in town. In those days, 256 Kbps was considered broadband and compared to what I (and others) was used to, it was fast indeed. This was while we were living in General Santos City. When we moved to Davao City, we were able to get DSL, 2 Mbps. Over the years, speeds got better and better. In February 2018 I got my first Fiber connection, 100 Mbps (both down and up). It was amazing. I was so happy. And, it was also reliable. It rarely ever got slow, and when it did, the speed came back in a short time. I was in heaven. In January 2019, earlier this year, I got my first US broadband. It is from Xfinity, through a cable modem. I got spoiled on the Synchronous connection on Fiber (fast downloads and uploads). Going back to an asynchronous connection over cable was great for downloads (150 Mbps), but uploads were too slow for my liking (10 Mbps). But, I learned to live with that, and download speed is the most important anyway. Starting a few weeks ago, around mid-March, I started experiencing speed problems, and also regular outages. Every evening, starting around 7 PM, I would suddenly lose Internet altogether. After about 10 minutes the internet would come back, but speed was very unstable. Speeds would vary between 2 Mbps to 30 Mbps. Slow either way, compared to what I was paying for. But, after 10 or 15 minutes of these slow and unstable speeds, my internet would die again for 10 or 15 minutes. What was going on? I was not happy, it was virtually unusable. Last night I did a lot of research, and today I decided to spend some money attempting to fix the problem. 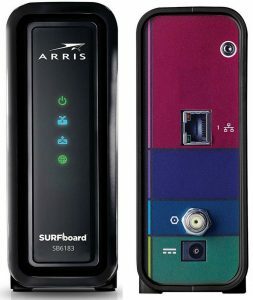 Firstly, I decided to buy my own Cable Modem, an Arris SurfBoard SB6183. I should have done this back in January because I have been paying $13/month to rent Xfinity’s substandard cable modem. Now, I bought my own modem and my Xfinity bill will be decreased by $13 per month, paying for the new modem in a short time. I have been studying about Mesh Networks for WiFi and decided that such a network would probably help me with the problems I have been experiencing. After studying it, I decided to go for Google WiFi. I have to say, I am very impressed with Google WiFi, even though I’ve only been playing with it for a short time. So easy to install. So many features. Just good all around. 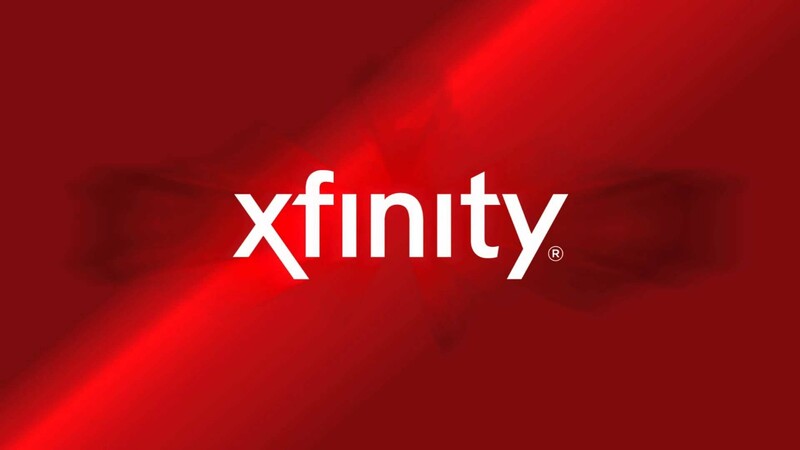 My first step was to set up the WiFi network, connecting it to my existing Cable Modem (the rented Xfinity modem). 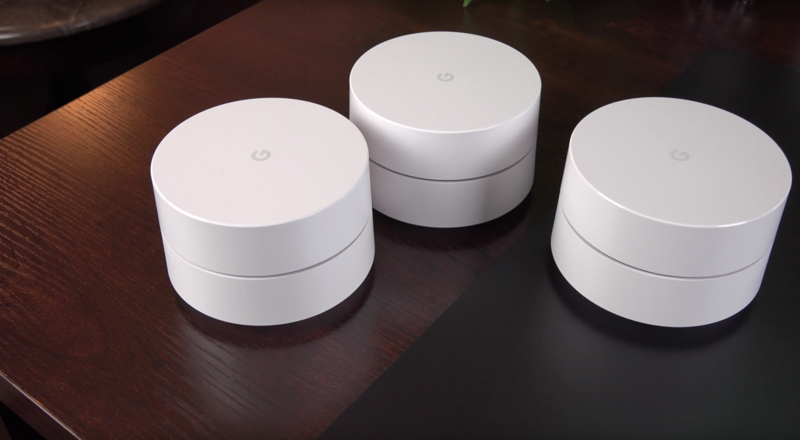 I had bought a 3 pack of Google WiFi access points. I set up the main access point in the master bedroom where the cable modem is. To set up the 3 access points took about 10 minutes, maybe 15 at the most. So easy to do, no tech knowledge necessary. Not only easy and good performance, but also nice looking equipment. After just 10 to 15 minutes the WiFi Network was working great. I had full WiFi signal strength throughout the house, which was not the case before. I had a few locations where I wanted to use Ethernet connections instead of WiFi, so I set those up next. Fast and easy, again. After all of the networking was good, it was time for me to switch from the Xfinity modem to the new Arris. It was all fairly easy. The most difficult part was getting the new Arris modem activated on the Xfinity network. I ended up having to call tech support and talking to “Ana” in India. Ana was a bit difficult to understand, but she was nice, and she was also helpful. 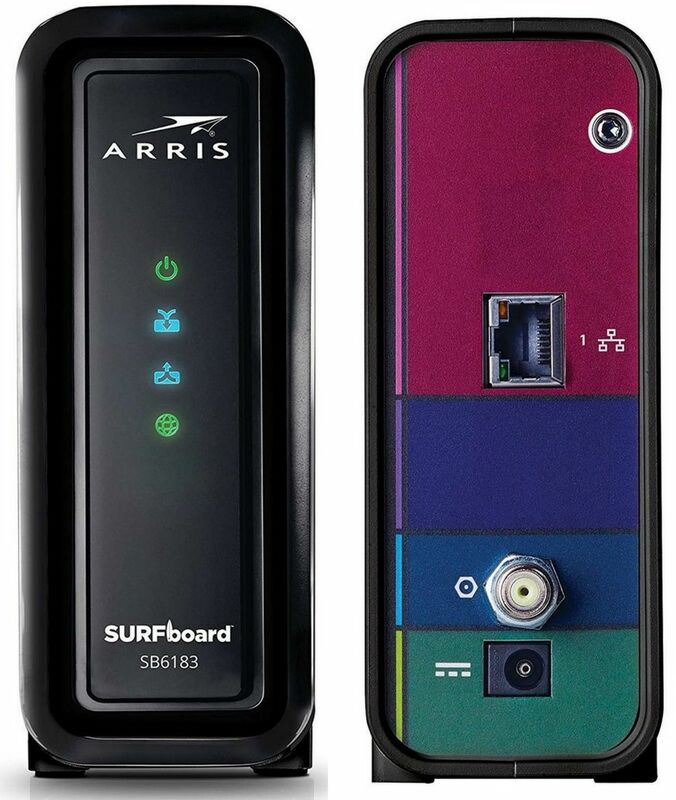 It took 30 minutes or so, but she got my new Arris Surfboard modem up and running. Well, as I type this, it is about 3 to 4 hours after I got everything set up and working. So far, it is fantastic. The serious internet outages and slow-downs that I have been experiencing daily always start around 7 PM, and go on through the night until I go to bed. As I type this, it is 8:30 PM and so far I have had no slowdowns or outages to my Internet. I think the problem is fixed. In fact, my internet, both upload, and download are quite a bit faster than I have seen yet. Although I had good internet in the Philippines, there are some things that just were not available there. The main thing I am thinking of is Mesh WiFi, like Google WiFi. A friend (expat in the Philippines) was asking me earlier what a mesh network was, and I explained it to him. I just have never heard of mesh network gear in the Philippines. Both the ease of setup and the ability to have strong WiFi everywhere in the house has greatly impressed me. It was expensive, but it was also a good investment, especially for somebody like myself, who makes his money on the Internet, and needs good connectivity. I hope I can get a Fiber connection someday soon here, but that is not available here where I live. But, for now, the Cable access seems great, especially since I have fixed some problems. I live in the country and all that is available is wireless from a local tower. Cable would cost over $100,000 $k to get to my house. Right now I’m limited to dialup or wireless. It’s interesting that the Internet is less in the country here than at my house in the country in the Philippines. Wow, LeRoy! That really is amazing! Glad you got your speed situation straightened out Bob. I had Comcast for about 10 years. At the time the modem rental was $7 per month but like you, I eventually bought my own. Comcast was OK as long as there were no service problems, when there was it was a real headache getting them to fix it. They always started off that it must be my equipment. They did not know that I knew their stuff out in the street was 30 years old and older, my stuff was nearly new. They were never on time when they had to come to my house to investigate a service problem but at the time they were the only game in town other than phone company DSL. Verizon ( formerly Bell System New York Telephone ) began installing an all fiber optic system where I live a few years ago as they are phasing out the old copper phone wires. I switched to the all fiber optic network which is fiber optic right into the back of my modem. I am paying for 50 up / down service but it is really closer to 100 / 100 at no extra charge. My landline phone is also on the fiber optic and I must say I am very impressed with it as it rivals the old copper phone lines in that it is 100% full duplex. Any other voip or other digital phone I have used was never 100% full duplex. Unfortunately Verizon does not offer TV so I held on to Comcast for a while and then dropped them completely. There are only so many hours in a day and being on the internet so much left me little time to watch TV and I was only watching the news on it anyway. I dropped Comcast completely and don’t miss the tv. There is no longer any off-air tv available where I live. When tv in the USA went to all digital the stations cut their output power in half and it no longer travels the 60 miles to my house as it used to in the analog days. There have been a lot of advances in the Internet since the days of dial up. My first experience with the Internet was with Web-TV on Dial Up. It was a lot of fun then but I dont think much could survive on Dial Up these days. I think buying your own Modem is a good choice. Yeah, getting tech support is tough, but when you finally get the right person it works OK. Right now, Xfinity/Comcast is more or less the only game here on my street. I want Fiber, hopefully someday soon. Like you, I don’t watch much TV. There are a few shows I like, but I can stream them. Back in those days I had ” computer fobia ” and Web-TV was the answer for those like me back then. I finally changed to a PC in the year 2000 and never looked back. Aren’t you happy that you took the leap? The computer just opens up the world to you anymore! It seemed a big leap at the time but I kept thinking that now I could experience the rest of the internet that I could not get with Web-TV. Microsoft bought out Web-TV and closed it down a few years later. The next big leap was going from Dial Up to broadband cable, since then I feel I have everything the internet has to offer. I don’t think I ever would have found Mindanao and Iligan City in the old web-tv and dial up days LOL. I totally agree. You would have never gone to Iligan, or even known about it perhaps. You and I would have never known each other!